The allium bed in April. 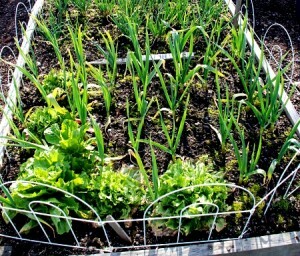 This photo shows the allium bed in April, but the garlic, shallots, Egyptian walking onions and multiplier onions were planted October 5. Last summer the bed grew potatoes. You can easily tell that I am following the rotate-your-crops method of gardening. I can only assume that bugs and diseases that might injure potatoes wouldn’t care to sample an allium. Well, after all, even slugs won’t eat aliums. This could be why I have an overwhelming desire to plant alliums. Garlic and shallots between the lettuce. About the same time last October, I realized that I had leftover garlic bulbs and shallot bulbs. There was still lettuce in a plot. Aha! I knew that the lettuce would be harvested through winter. So I poked the garlic and shallot bulbs into the ground between the lettuces. It worked! Here’s that bed in April. Most of the lettuce is gone, and the alliums are doing great. Neat trick, huh? Ok, about the problems with certain alliums. I planted bulbing onions several years ago. I was at a garden show in February, and there were little sacks of tiny onions: red, white and yellow. I couldn’t resist. I planted them according to the package directions, and…they were fabulous. They grew into great large onions. We almost had to resort to onion sandwiches. But, alas, although I have tried to grow bulbing onions ever since, they have all bolted, turning into mush in the garden. Don’t ask me! I have no idea what’s going on. And yes, I carefully buy onion sets for our latitude. Send me a comment if you have a solution. The other problem happened this year. I planted French shallots along with all the other alliums in October. Not a single one came up. Most simply disappeared. Two looked just like they did when I planted them. Perhaps they were embalmed. Well, never mind. I’ll try again later. 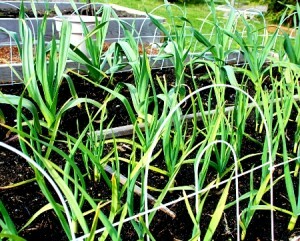 In the meantime, I planted Walla Wall Sweets in the holes left by the French shallots. Just one last note on the alliums. They love fish fertilizer. Thanks, Linda. I’ll be posting more as time allows. Jan, I LOVE YOUR WEBSITE. I am keeping it as a favorite to check out new articles.